This IBM Redbooks publication will help you to tailor and configure Communications Server for z/OS (CS z/OS) to make full use of Enterprise Extender (EE) capabilities. It focuses on the migration of your Advanced Peer-to-Peer Networking (APPN) environment to Enterprise Extender, while offering easy-to-understand, step-by-step guidance. Sample scenarios are provided that discuss Enterprise Extender connections between multiple z/OS systems as well as between z/OS and non-mainframe systems. The non-mainframe platforms in our examples include IBM Communications Server for AIX (CS/AIX), IBM Communications Server for Linux (CS Linux), IBM Communications Server for Windows (CS Windows), IBM Personal Communications for Windows (PCOMM), and i5/OS Enterprise Extender support. 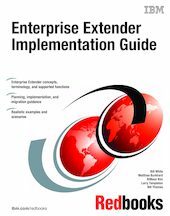 This publication provides information to assist you with the planning, implementation, and setup of Enterprise Extender. In addition, it describes helpful utilities and commands that you can use to monitor and operate the Enterprise Extender environment. It discusses the motivation for migrating to Enterprise Extender and explains the planning decisions that must be considered before attempting each phase of a migration. Further, it illustrates working scenarios, highlighting the important aspects of configuration and connectivity, and discusses techniques for avoiding undesirable situations. It explains the changes that are necessary in the VTAM and TCP/IP definitions to support Enterprise Extender in each scenario. You should have a solid background in SNA, APPN, and TCP/IP networking, as well as experience in the setup and operation of Communications Server for z/OS (VTAM and TCP/IP). Whether you are a systems engineer, network administrator, or system programmer that will plan for and configure Enterprise Extender, this book will be useful to you. Enterprise Extender requires an APPN/HPR environment. Because base APPN functionality has been available on z/OS for years, and many product manuals and Redbooks have been written on basic APPN implementation, this publication does not cover the details of migrating from an SNA subarea environment to a base APPN environment. That information can be obtained from existing publications. However, adding HPR support to the base APPN environment is explained and described in detail, with examples.